Meet and assist our representative upon arrival at Delhi Welcome in Indian tradition. After transfer to Hotel with assistance. Rest of the day free for leisure. Over night at Delhi. After breakfast proceed to historic city visiting Old Delhi visiting the majestic Red Fort, a marvel in red sandstone, Jama Masjid, the largest mosque in India, both built by emperor Shah Jahan of Taj Mahal fame, Rajghat - memorial of Mahatma Gandhi & a Rickshaw ride past through the silver street in Chandani Chowk. , later sightseeing continues to visit New Delhi include Rashtrapati Bhawan, one-time imperial residence of the British viceroys; the India Gate, a memorial raised in honour of the Indian soldiers martyred during the Afghan war; the Laxmi Narayan Temple, built by the Birlas, one of India’s leading industrial families; Humayun’s Tomb, lotus shaped Bhai’s Temple, Qutub Minar, built by Qutub-ud-din Aibek of the Slave Dynasty. Over night at Delhi. Morning after breakfast leave for Sariska, check in to Hotel. 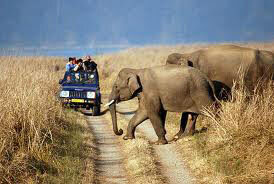 Later afternoon sight seeing with Jeep Safari to view Wildlife. Overnight stay at Hotel. Morning after breakfast drive to Jaipur, check in to Hotel later take full day sight seeing of Jaipur including, City Palace in the heart of Jaipur known for its blend of Rajasthani and Mughal architecture. Not far away is the Central Museum with its large collection of woodwork. Another monument near the City Palace, Jantar Mantar, is the largest of the five observatories built by Sawai Jai Singh-I, the founder ruler of Jaipur. Stop at Hawa Mahal or the Palace of Winds, a seven storied facade and one of the most picturesque monuments constructed for the royal ladies to watch the royal processions without being seen. Overnight stay in Jaipur. Morning after breakfast check out from the hotel and excursion to Amber Fort, situated outside the walled city, is perhaps the most beautiful example of Rajasthani forts. You can have the unique experience of riding on elephant back to and from the top of the hill on which the fort is situated. Later drive to Ranthambore check in to Hotel. Overnight stay at Hotel. Early morning visit Sanctuary with Jeep Safari to spot a wide variety of wild animals including Tiger, deer, wild boars etc. Return back to the hotel for breakfast. 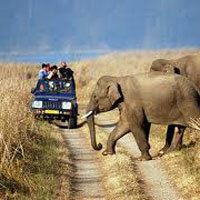 Later after lunch yet another visit to wildlife sanctuary to encounter the missed out species during your morning visit. Evening take another Jeep Safari for visit Sanctuary. Overnight stay at the hotel. Morning after breakfast drive to Bharatpur. Bharatpur has its fame due to Keoladeo Bird Sanctuary. Keoladeo Ghana Bird Sanctuary is finest bird sanctuary in Asia. Bharatpur was earlier a duck shooting resort of the Maharaja. Keoladeo Bird Sanctuary with its 375 species is one of the best Water-bird sanctuaries in the world. In winter there are many migratory birds from the northern hemisphere including the rare Siberian Crane. Check in to Hotel later visit Bird’s Sanctuary. Overnight stay at Hotel. Morning after breakfast checkout from the hotel and drive to Agra en-route visit Fatehpur Sikri, which was once an imperial capital frozen in time, constructed by Akbar the Great in the 16th century. This wonderful city constructed by red sand stones was abandoned as abruptly as it had been built. It has been generally stated that it was due to failing in the water supply. Later drive to Agra. Check in to Hotel after freshup take half day sight seeing tour of Agra including Agra Fort designed and built by Akbar in 1565 A.D., built with barricaded wall of red sand stone; it houses the beautiful Pearl Mosque and numerous palaces including the Jahangir Mahal, Diwan-i-Khas, Diwan-i-Am, Macchhi Bhawan, Nagina Masjid, Meena Bazar, Moti Masjid, Sheesh Mahal, Musamman Burj where from Taj Mahal is visible in all its beauty from one side of the fort. So very ironically, Emperor Sahahjahan, prisoner of his son Aurangzeb in his old age was put in a cell from where he could gaze at the Taj Mahal at a distance, from his cell in the fort. After visit to Pearl Mosque and the Tomb of Itamad-ud-Daula built by Empress Noorjehan in memory of her father. Overnight stay at Hotel. Morning after early breakfast visit the magnificent Taj Mahal - one of the seven wonders of the world surely the most extravagant expression of love ever created. 20,000 men laboured for over 17 years to build this memorial to Shah Jahan's beloved wife. Later drive to Delhi and transfer to International Airport to board flight for your onwards journey to home town.